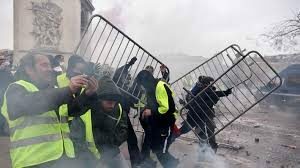 Many people who have seen or read about the recent violent demonstrations of the “yellow vests” in Paris have asked me: How bad is it? I have lived in Paris for the past 47 years and have seen many demonstrations, but never anything like this. (As an aside, French police say exactly the same thing). In France, demonstrations or manifs, short for manifestations, are frequent and generally peaceful although many times troublemakers come in at the end to loot and pillage. But the demonstrations held the last three Saturdays in Paris and throughout the country are different. The thugs did indeed come from the outside – but they were inside as well. And that’s a surprise, actually, considering that 72 per cent of the French approve the yellow jackets and their protests. They see their colourfully clad compatriots as non-violent which is the image that the protesters give – and what one can hope they probably are for the most part. But, according to the Prefet de Police, there’s another side to the story. Of the hundreds of people arrested and summoned to make an immediate appearance for acts of violence, the majority were men from the provinces aged between 20 and 45, with jobs and families, whose main aim in coming to Paris was precisely to have a fight.The others were the usual delinquents and thugs from the extreme left and extreme right. Some of the yellow vests don’t even deny the accusation: They are filled with rage against the government and high taxes, feel they have nothing to lose and say that their acts of violence and vehemence are nothing next to the “violent” way in which they are being treated by the government. A few weeks ago, just when the movement was starting, I took a trip to southwest France to the village where my mother-in-law was born. It’s a pretty little town in the Périgord where many English, Dutch and other foreigners settle to enjoy the fabulous food and wine and scenery. So far all good and well. But as I walked down the streets admiring the ancient massive golden-stone houses which reeked of history, I saw abandoned shops as well as shops with hardly anyone in them. I didn’t see a post office or a hospital; it’s possible that people living there have to travel when they need to see a doctor or post a letter. And that’s one of the reasons the yellow jackets are mad: in the absence of the public transportation people in big cities enjoy, they depend on their cars. And their cars need gas. And gas prices have skyrocketed due to a new energy policy and new taxes imposed by the Macron government. One woman living in a small town in Brittany wrote an angry post about this situation on Facebook and it spread like wildfire: a popular movement against the government was born. And the protests began. The movement eschews leaders and is having a hard time organising to meet and hold discussions with the government. The movement doesn’t like or want unions or political parties to interfere. This total lack of structure is responsible in part for the chaos reigning in the demonstrations. The third demonstration, on Saturday, December 1, was an unmitigated disaster, fuelled by rage. Cars burned, cobblestones and barricades and projectiles of every kind were hurled at the police – who were accused of not being aggressive enough (but if they had been, things would have been even worse. They were ordered not to engage with the protester. One police officer, in a television interview, confessed that he was convinced that some of the yellow vest protesters were there, not just to injure, but to kill). My take on this? 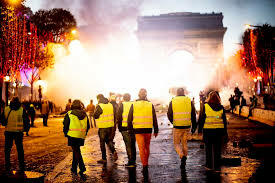 I’m sorry for the low-paid, highly taxed nonviolent yellow jackets who simply want to be able to live decently and who are offended and angered by Macron’s lack of response to their demands. He really does need to address them with compassion and offer them viable solutions. They see him as a cold Parisian technocrat who cares nothing about the little guy. He needs to at least look like he cares. I am sorry for the store and restaurant owners whose premises have been trashed and whose livelihoods are endangered by all the damage done to their businesses. I am aghast at seeing the Arch of Triumph tagged outside and ransacked inside. I am horrified by the spectacle of the yellow jackets tearing down the gates around the Tuileries. I once saw an excellent film about the French Revolution and those protesters chillingly reminded me of the people railing against King Louis XVI and his lack of response and compassion. Let’s hope everyone and everything will settle down and this doesn’t end in a beheading! Next Saturday, December 8: Act Four (and we hope, the last act) of this continuing French psychodrama. This entry was posted in Uncategorized on December 3, 2018 by harriet.welty.